Do you remember where you were fifteen years ago today? I do. 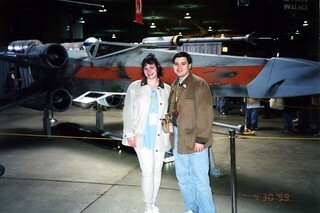 I was in Denver, along with my wife, for Star Wars Celebration, the first official Star Wars fan event. 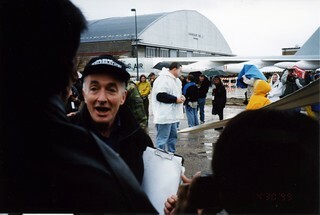 Celebration took place April 30 – May 2 in 1999 at the Wings Over the Rockies Air and Space Museum in Denver, Colorado. This was the first of three Celebrations I attended. 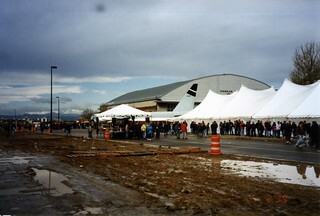 The accurately (if unimaginatively) named Celebration II and Celebration III were held in Indianapolis at the convention center, a much more suitable space for an event of this type. In 1999, however, I don’t think the organizers really understand what was in store for them. The Star Wars Fan Club was based on Denver, so it was felt that Celebration should be there as well. Unfortunately the Air and Space Museum wasn’t the best venue for the roughly 20,000 people who showed up. The exhibits as well as smaller panel sessions were in the main museum building, but the big presentations were held in a huge tent setup outside. The vendors were under the tent as well which made it a bit awkward. The tent and having to go back and forth between the building and the tent would all have been fine except for one thing… the weather. It was cold. It was wet. It was muddy. People started calling it “Wookstock” in light of the similar wet conditions at Woodstock. 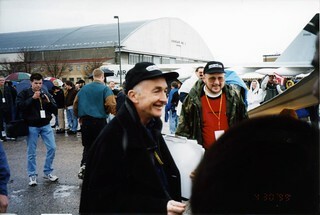 I remember the last day of the convention, waiting outside in the drizzle for the shuttle back to the hotel, shivering as the cold went right to the bone is was so damp. Ugh. Thankfully, the event itself more than made up for the awful conditions. Episode I was due to be released in a few weeks, and the excitement was palpable. (Palpatineable? sorry…). It had been 16 years since Return of the Jedi, so people were ready for new Star Wars. Now before anyone starts weighing in with how much they disliked any or all of the Prequels, let me say that I enjoyed them. Are there things that could have been better? Of course. But if I look at the saga as a whole, from Episodes I-III, the Clone Wars, and Episodes IV-VI, I’m content with how it turned out. If you aren’t, that’s fine, but I really don’t want to get into a discussion about it because that discussion/argument/schism is one that I don’t think people will even agree on. If we disagree, then let’s agree on that and move on. 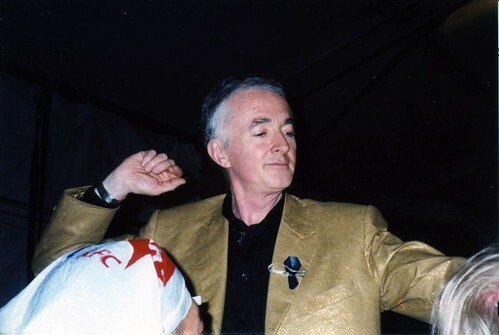 Anyway… Anthony Daniels was our host in the big tent, and they couldn’t have picked anyone better. He is as down-to-earth as anyone can be. Very friendly and gracious. While we were waiting in the cold (under cover at least) to go into the tent, he came by to say hi to everyone and commiserate about the dreadful weather. Inside he was the perfect emcee, making a grand entrance in a gold lame jacket, just in case we forgot who he plays. He brought the house down the first time he went into C-3PO mode. The voice, the mannerisms, the coat! It was like we were there with everyone’s favorite protocol droid himself. Celebration was full of experiences like that. Props, and droids, and personalities from the Star Wars Universe whether from the movies or books or more. Of course, this was a modest affair compared to what followed in 2002 and 2005 as the event grew and attracted bigger crowds of attendees and more notable guests. Carrie Fisher showed up at Celebration II and the lines for her autograph session were unbelievable. George Lucas — the Creator himself — was there at III, but alas we weren’t able to make it into that session to see it live. I can only imagine what the Celebrations since have been like since we haven’t been back. I’m sure one of these days we’ll go back but other destinations are consuming our travel time these days. I’ll eventually post more photos from Celebration on Flickr, but the photos included here are the highlights. I pulled them from the photo album (no digital camera or smart phone back then) to scan last night. I’ll close with a couple of pictures to prove that we had a bit of mud to deal with. Enjoy!